Though A Far Cry tours nationally and abroad, the group still calls Boston home, renting a storefront in Jamaica Plain as rehearsal space. 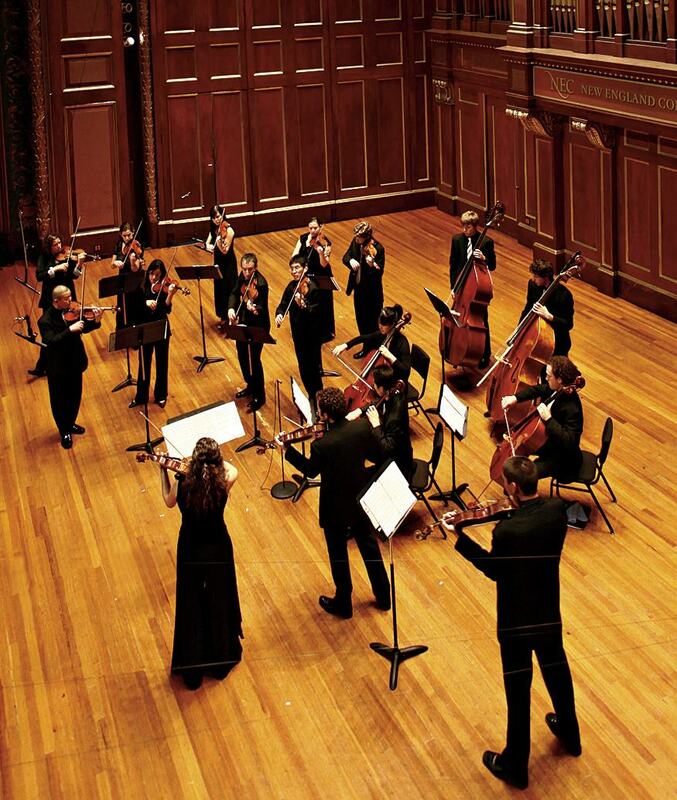 A Far Cry in performance at Jordan Hall, at the New England Conservatory. Mounted on the wall of the botánica next door, where the devout can buy incense and saints’ images, painted statues of angels stare into the rented storefront in Jamaica Plain where A Far Cry rehearses. Having someone to watch over them could help the members of the young chamber orchestra make their way in the classical music world, and its crowded Boston scene—especially since these 17 violinists, violists, cellists, and double bassists play without a conductor’s guiding hand. But the grace of this leaderless (and, as they admit, “highly opinionated”) crew is no divine gift; it’s a deep trust, cultivated over time. No group of this size and kind could come so far without some rules. In earlier years, rehearsals sometimes became free-for-alls, getting feisty and then derailed, as members quarreled over how to play a particular work. These days, A Far Cry runs like the high-functioning parliament of a small country. Each work has a new set of principals—one leader from each instrumental section—who lead the group’s practice. Only a principal may stop a run-through. Then, the floor opens to any two musicians who wish to comment on an issue small enough to be quickly addressed—a few bars, a particular phrase. Because of this system, a rehearsal for a single concert can shift styles from hour to hour. One set of principals may tape up a diagram of a Mozart divertimento, to help the group visualize its shape. Another team, leading a Stravinsky concerto, may narrate a scene to evoke a desired mood, instructing everyone to imagine “Romeo first setting his eyes on Juliet—‘I see you, I want to dance around you, feel you out.’ ” On rare occasions, the Criers appoint a “spanker,” a member empowered to unilaterally cut off a discussion, or just to yell. They follow equally civil procedures to determine the year’s concertmaster, programming, and distribution of principal parts. This fall, A Far Cry launched their own recording label, Crier Records, with their first concept album. Miki-Sophia Cloud conceived of Dreams and Prayers as an exploration of mysticism, and of music’s role in humanity’s relationship to the divine. It spans three religious traditions: a sequence from medieval Christian abbess Hildegard von Bingen’s The Origin of Fire, played by the violins in monody; a commission from Turkish composer Mehmet Ali Sanlıkol, inspired by Sufism; and a new arrangement of Jewish composer Osvaldo Golijov’s The Dreams and Prayers of Isaac the Blind. It also includes one of Cloud’s favorite pieces, Beethoven’s String Quartet No. 15, “Heiliger Dankgesang,” written after the composer had recovered from a long illness. In the liner notes, she writes about how, before each concert, she freed the audience of their obligation to clap politely. They could sit in silence to absorb the last notes of a piece as it faded—or, as some did during the livelier works, get up, clap, and whoop. Update: Dreams and Prayers has been nominated for a Grammy Award. Read more about the album, and Crier Records' recent projects, here .